UPDATE: Please read related post FDA Bans Use of Some Antibiotics In Animal Products. Almost slipping through the cracks unnoticed, the Food and Drug Administration (FDA) has reneged on its intention to have mandatory restrictions regarding antibiotic and hormone use in animal agriculture. Clearly, they realize this may not be a popular move, since they made virtually no notice of it, with the exception of a holiday-eve posting in the Federal Register. Sneaky. 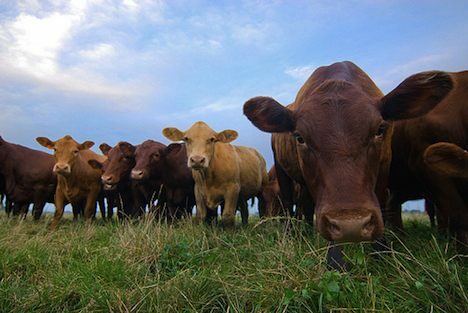 Every year, 29 million pounds of antibiotics are given to animals, typically via their feed. This accounts for 80% of all antibiotic use in the U.S., and groups such as the Pew Charitable Trusts and Union of Concerned Scientists have been calling for an end to the practice for years. Even the FDA’s own watchdog group, the Government Accountability Office, opposes this move. According to microbiologists and public health experts, there is plenty of consequence in a lack of action. Restrictions on agricultural antibiotics are key to preserving the effectiveness, as well as preventing the spread of antibiotic-resistant bacteria. This isn’t the first time the FDA has pulled a move like this, either. When bans were being pushed regarding BPA, an endocrine-disrupting chemical used in plastics, receipts, and food packaging, the agency claimed their hands were tied by regulations. However, once the lobbying group American Chemical Council petitioned for the ban, they decided to follow through. Basically, they’re going ahead and admitting that as long as there is industry opposition, they won’t try to keep antibiotics out of our meat and dairy products. They’re also admitting they have no power over the industries they regulate. That’s comforting, isn’t it? If they’re not going to protect us from the money-hungry industries providing our food and nutrition, then who will? Just to preempt any “Obama has let us down again” talk, I would like to mention that, while this is important, we have thousands of other important things to worry about without also having to worry about another Republican President. Also, Obama doesn’t have his hands in every single decision making process in every agency. Sure. And there are a few issues where both parties, it seems, are not all that different. How does this info square with this recent NY Times article?? We’re about to post an update. They initially posted the notice and then announced the restrictions a few days later.